The best snack to have when it rains. Mungode are small sized round(ish) fritters made from dhuli moong daal (skinned and split green gram beans) and are best served with hot tea on a rainy day. I, however, am forever ready to make and eat them. You can team it up with a spicy chutney and serve it along with cold beer in summers, or serve them hot in winters. I never get tired of making mungodas and prepare it so often that all my friends have had it atleast once. Whole cooked mung beans are generally prepared from dried beans by boiling until they are soft. Mung beans are light yellow in colour when their skins are removed.Mung bean paste can be made by dehulling, cooking, and pulverizing the beans to a dry paste. Although whole mung beans are also occasionally used in Indian cuisine, beans without skins are more commonly used; but in Kerala, whole mung beans are commonly boiled to make a dry preparation often served with rice gruel (kanji). Dehulled mung beans can also be used in a similar fashion as whole beans for the purpose of making sweet soups. Mung beans in some regional cuisines of India are stripped of their outer coats to make mung dal. Wash and soak the moong dal in tepid water for about an hour. Grind it into a coarse paste. Add Onions, ginger, green chilies, coriander and salt to the ground dal and mix well. Heat oil in a wok and drop small quantities of dal mixture. Remove from oil after they turn golden. 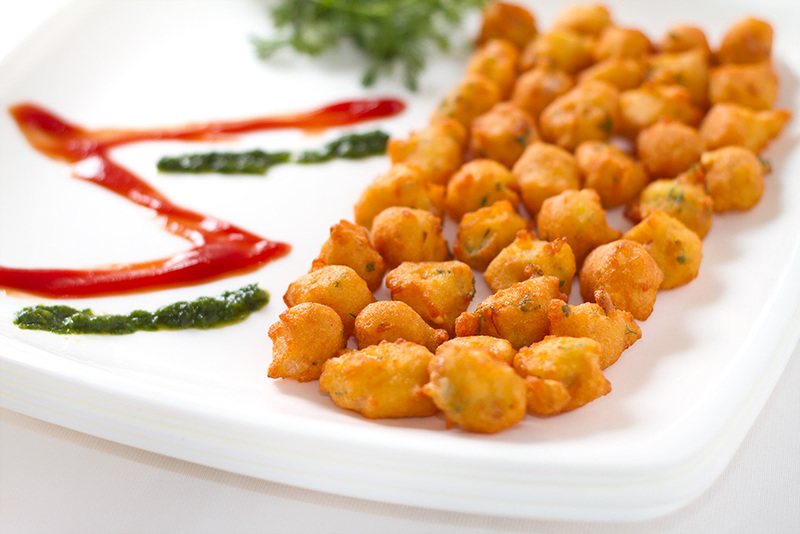 Serve the mungodas hot with tomato sauce and green chutney. Serve with tomato sauce or a chutney of your choice along with a cup of hot tea. Hi Swati, I tried out your Mungode recipe recently and we really enjoyed it. Thanks for sharing. Thank you. Glad that you liked the recipe.